As a clarinet or flute player, most of your notes are based on proper breathing techniques, embouchure, and finger placement. Executing proper dexterity at the right moment makes the difference between the right and wrong note. These precise and quickly finger movements required by these instruments, make clarinet and flute players susceptible to injuries of the fingers and wrist. 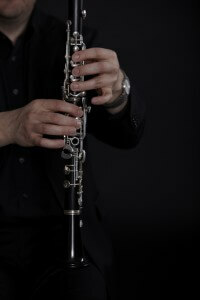 In clarinet or flute playing, the small tendons in the fingers and wrist are used to relieve the great deal of pressure that each finger movement can create. When the tendons become inflamed, movements of the wrist and fingers become painful. The most common cause of tendonitis is overuse. As musicians progress in their careers, the increased level of difficulty forces them to utilize the wrist and finger tendons much more rapidly. The tendons are not yet accustomed to performing at this level of demand and eventually become inflamed and therefore, painful. Age also plays a role in tendonitis. As we age, tendons lose their flexibility and ability to stretch as they once did. Many are more prone to experience symptoms of tendonitis and carpal tunnel with age. An additional disorder similar to tendonitis named De Quervain’s Syndrome consists of pain in the tendons at the base of the thumb and on the thumb side of the forearm. This makes it extremely painful to twist the wrist or move the thumb away from the hand while playing. Carpal tunnel syndrome is often confused for tendonitis because they are caused by in creased pressure in the wrists and hands, but carpal tunnel syndrome has distinct differences from tendonitis or related disorders. The carpal tunnel is a narrow passageway of ligament and bones at the base of the hand. This passageway surrounds the median nerve, which runs directly from the hand up into the forearm. The median nerve controls receptors to the palm side of the thumb and fingers, which allows the smooth and flexible movements of the fingers and thumb. Chronic neck pain and back pain are other issues that you may face. Neck and back pain can be caused by poor posture, both standing or sitting; poor seating arrangements, in order to properly see the conductor; or poor instrument lifting techniques. Pain can be located in the cervical, lumbar regions, or in all regions of the spine. Depending on the area of the spine that is afflicted, this pain may radiate into the shoulders, arms, legs and fingers due to nerve entrapment over time. If you, or someone you love, is suffering from any of these conditions please contact us. At Pain Physicians NY, we are experts in treating injuries in musicians and performers. We utilize a multi-disciplinary approach to accurately diagnose and treat your pain. Our goal is simple: TO GET YOU BACK ON STAGE!